My quiet corner of the Cotswolds, here in drizzly England, is pretty to look at, with stunning countryside all around, but you certainly couldn’t describe it as ‘exotic’. Well, my tiny garden may be just about to change that, albeit on a very small scale! For this growing season I’ve decided to grow some of my own spices to create a truly homegrown curry. I’ll need a bit of sunshine (here’s hoping!) and, possibly, just a touch of luck, but come autumn I should have most of what I need to cook up an Asian classic. If you are gardening in slightly more settled climes, then you should have no problem growing some spices. If not, then a greenhouse or cold frame will improve your chances. Here, then, is what I’m going to be growing. Every curry needs some ginger, whether grated or sliced into thick, face-flushing chunks. In temperate climates like mine you’ll be able to harvest fresh leaves at the very least. The leaves have a milder taste than the roots but will still give curry a gingery hint. You can grow ginger from a healthy finger of root (actually a rhizome) from the grocery store. Look for one with a pointed growing bud at the end. Like seed potatoes, ginger can be encouraged to produce shoots by keeping the root in a warm, bright place for a couple of weeks. To plant it, set the root, bud-end up into a pot of soil-based potting soil. Bury the root about 5cm (2in) deep. Keep the potting soil moist and then, once the plant gets growing, apply a houseplant feed every few weeks. Pot on into larger containers as the roots reach the sides of their pots. As autumn approaches, dramatically reduce the volume of water you apply so the potting soil dries out. This will cue the straggly plant to produce its rhizomes. Enjoy some of the leaves this year, but for rhizomes you’ll need to let them continue to grow on throughout the following year. Overwinter plants in a warm, bright place then pick up watering and feeding again once spring returns next year. By the end of next summer you should have a few useable rhizomes. Like ginger, the fresh rhizomes are the most useful parts of turmeric. The leaves are more striking than ginger leaves and have the appearance of aspidistras, making turmeric an attractive plant in its own right. To grow some turmeric, begin by seeking out a rhizome; Asian food stores are a good place to find them. Again, look for a piece with a rhino horn-shaped bud, which indicates it’s ready to sprout. Encourage the sprouts by setting the root into a container of soil-based potting soil, just covering the rhizome over. Turmeric rhizomes like damp soil and a room temperature of around 20ºC (68ºF). As the plant grows, pot it on into multipurpose potting soil, enriched with some garden compost. The leaves may yellow in winter due to low light levels. Keep the plant indoors over winter, away from draughts, and it should spring back to life the following growing season. The leaves can also be used to flavour curries, submerged like bay leaves. As with ginger, you will need to wait until the end of the second growing season for your first roots. Citrusy lemongrass freshens up a good curry with its zesty tang. It’s very easy to grow and will give some stems to use in your cooking by the end of the summer if planted in early spring. 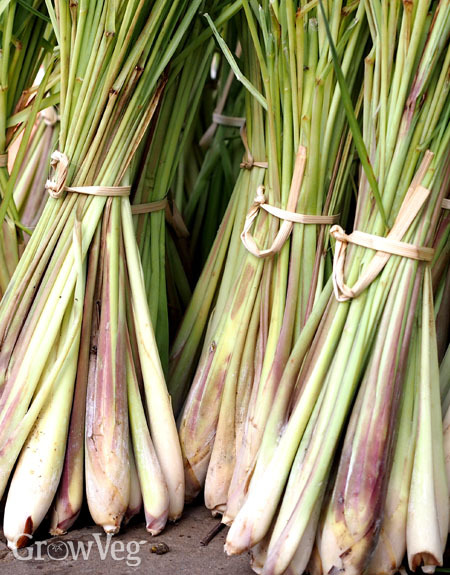 You can plant lemongrass stems bought in the store, so long as the bulge at the bottom of the stem, from where the roots emerge, isn’t damaged or cut off. Plant up lemongrass stalks into containers of potting soil mixed 50:50 with gravel for drainage. Keep the pots somewhere warm – around 18ºC (64ºF) should do the trick. Once roots begin to grow and fill the pot, the lemongrass can be potted on into potting soil that’s rich in organic matter, perhaps improved with your own garden compost. Give your plants plenty of light and water and apply a balanced liquid feed every few weeks. You can even plant them out into garden beds after any danger of frost has passed. By the end of the growing season the plants should have bulked out enough to give up a few stems for cooking. Keep a few of the stems behind and overwinter them for next year. Gently spicy fenugreek is often grown as a green manure or cover crop, but it also makes for very good eating, adding a pleasantly pungent-yet-mild taste to curries. It’s very quick growing and reasonably tolerant of cooler weather, so is certainly worth a try in any garden. Coriander seeds are exceptionally easy to grow. Simply leave coriander plants to set seed after you’ve had your fill of leaves then harvest once the seeds heads are fully dried out. Coriander readily goes to seed while days are still lengthening, so a spring or early summer crop will have no problem producing seeds for storing and using over winter. Chilli peppers need no introduction. Forming the basis of just about any curry – from Caribbean to Indian or Thai – this is one must-grow fruit that’s sure to liven up your cooking. I’ll be opting for a super-hot variety, then drying the chillies for a convenient year-round supply of heat. There are plenty of other spices I’d like to grow, including curry leaves and kaffir lime leaves, but I’ll give these ones a try first. If you have grown your own spices, I’d love to know how you got on and if there were any special tricks you used to ensure a bumper crop. Please do let me know by dropping a comment below. "I LUV your site! Thank you!" "I have just planted my first horseradish ,in a large pot, and if there are any tips I would love to hear them ,love your site ." "We have a great article by Barbara Pleasant on how to grow, harvest and prepare horseradish. Just search 'horseradish' in the search box in the top-right of this web page. It's a fantastic plant to grow - enjoy!" "Cumin and curry plant are surely a must for a curry garden? If you like Thai food then galangal - similar to ginger - should be on your list as well. I found a local supplier and am eagerly waiting for the pre-order list to open next month :) I look forward to your experiences even though most of Britain has very different conditions to Johannesburg! I always enjoy your work and growveg's articles and videos are excellent summaries. Thanks to all for making it happen :)"
"Hi Tessa. Yes - cumin would be a good one to grow too, with sowings made six or so weeks before the last frost. It would definitely benefit from the warm summers of Jo'burg! Very exciting for you to be on the alert for galangal. Let us know how you get on with it. It's hugely satisfying to grow a few exotics like that, as well as the 'ordinary' fruits and vegetables."